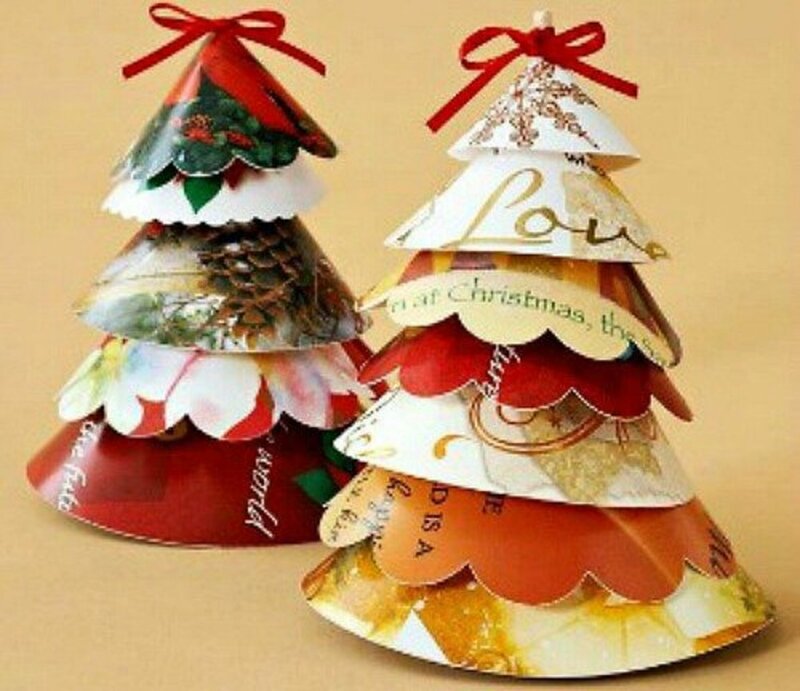 Every year, we make new decorations for our Christmas tree, preferably using new materials or trying a new craft in the process. 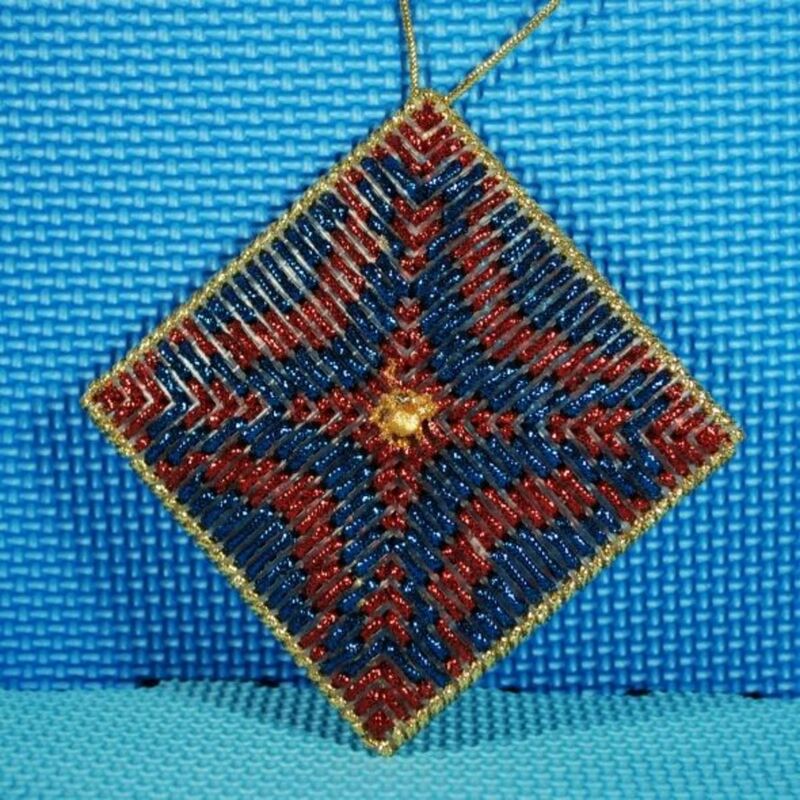 For 2012, I went with materials I've not used before; shaped plastic canvas and metallic yarn, and combined them with more familiar techniques. I hope these photos inspire you to give it a try, too! First things first! 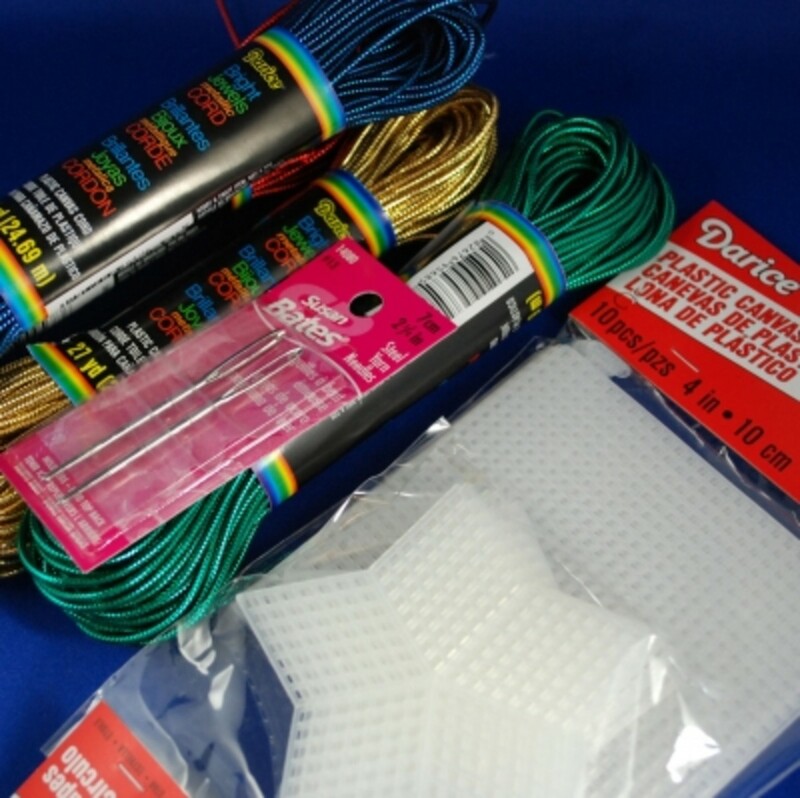 Here are the supplies needed to make these ornaments. 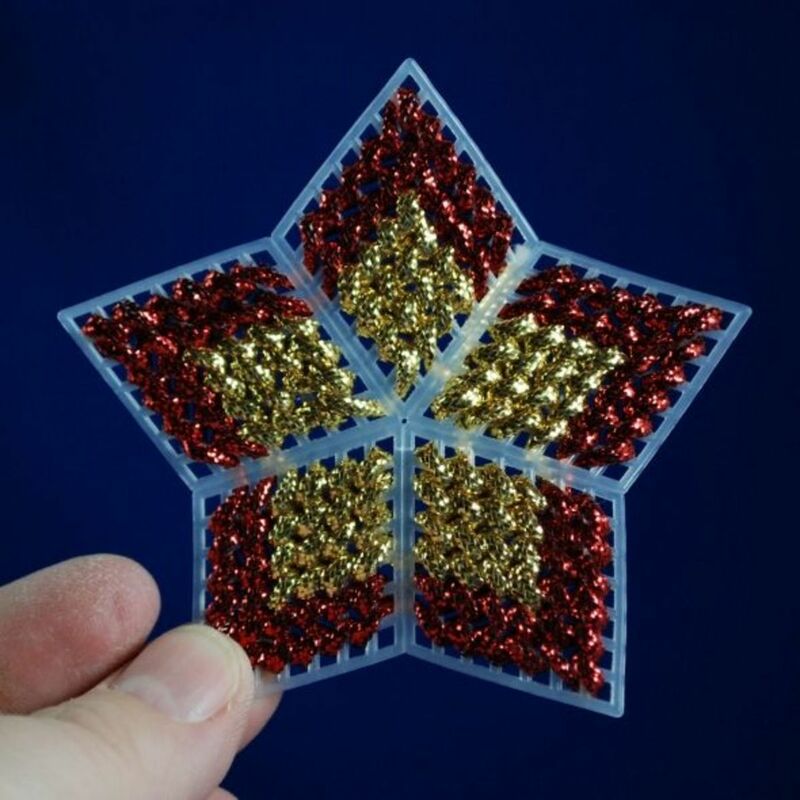 Plastic canvas shapes: I chose stars and squares, but you can also choose from shapes like circles and crosses. 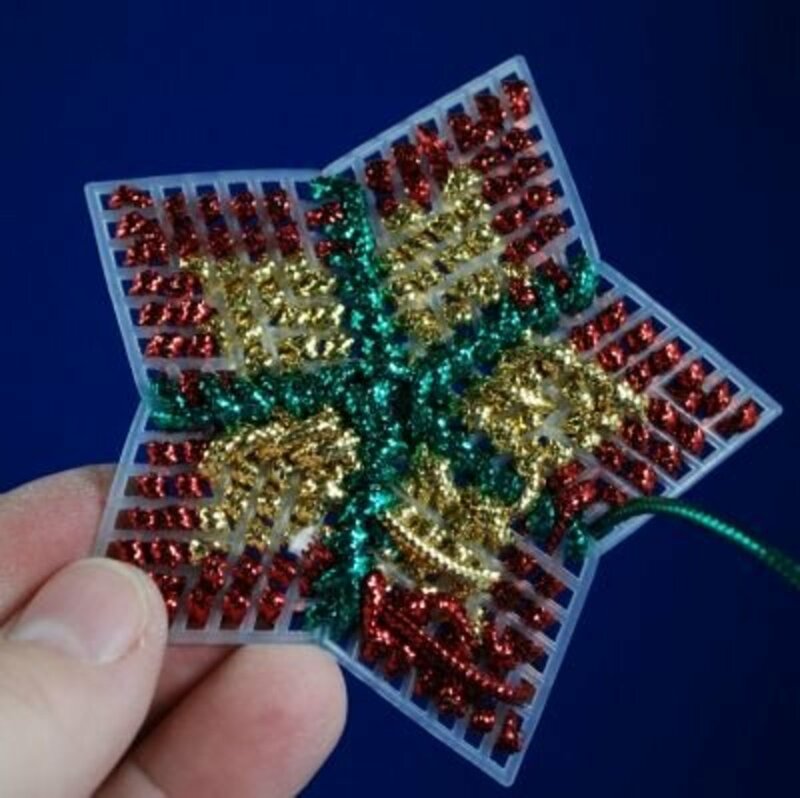 Each ornament uses two shapes for the front and back. Metallic Cord: This type of cord is available in a variety of colours, but I stuck with just four; red, blue, green and gold. Steel Yarn Needles: choose strong needles with large eyes and blunt tips. Though there are plastic versions available, you'll need the strength of steel for this project! Scraps of yarn: to cover the backs of the ornaments, this is a good time to use up the little bits of yarn left over from other projects! Or, select yarn in colours to complement the metallic cord. Optional extras: gems and sparkle glue to decorate ornament centres. For the star shapes, I didn't plan too far ahead with what I wanted to do, but rather used the shapes themselves to inspire the design. 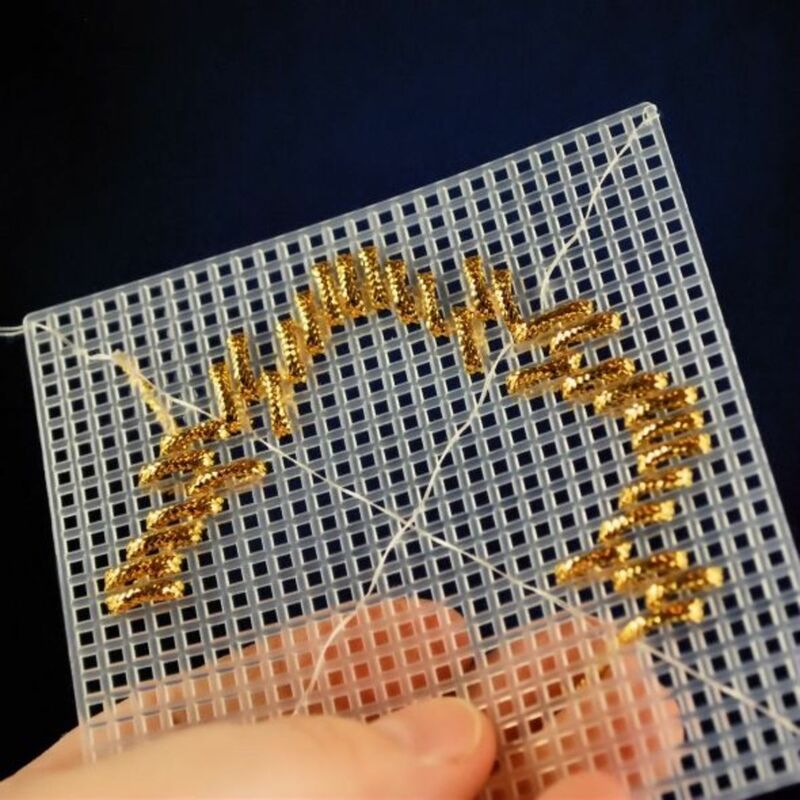 To begin, I used straight stitches in gold to fill in five diamond shapes. 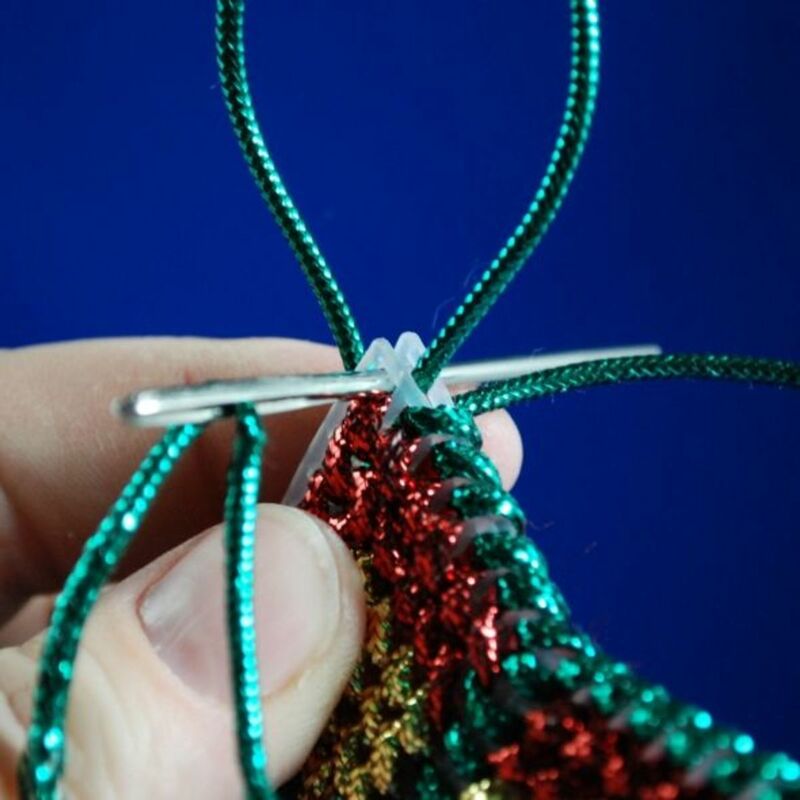 Remember to anchor your cord ends under your stitches at the back, rather than using knots. The five gold diamonds were then framed in red, leaving the edges for joining. Before filling in the empty spaces, set this aside and begin work on the back piece. Since we don't want to see the ugly back side of the stitched pieces, backing pieces need to be made. 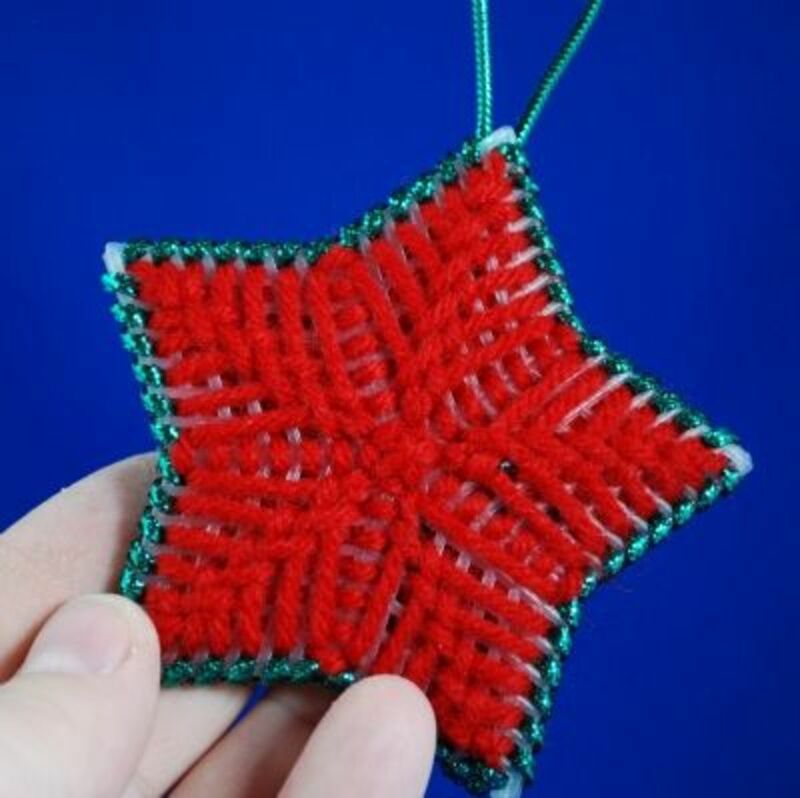 For this ornament, I chose to use red yarn and a leaf stitch to cover the entire back. Now it's time to return to your front piece. 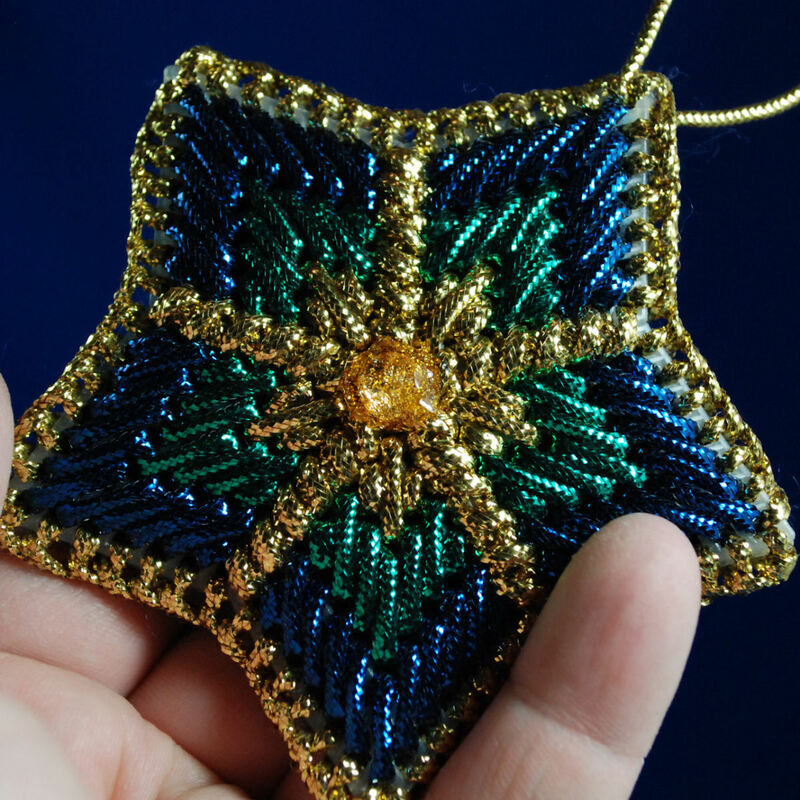 Using green, fill in the empty spaces in between the diamond shapes with straight stitches. Do not finish off the end, as you will continue stitching around the edge next. Here's a back view. As I worked up and down the "spokes", I hid any lengths of cord under my stitches. 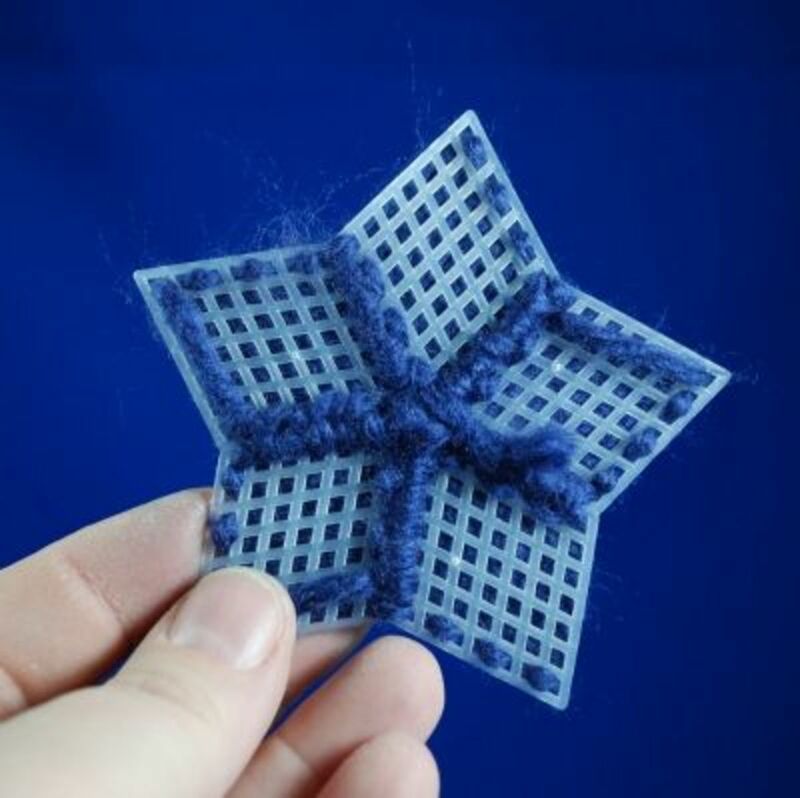 Hold front and back pieces together and begin joining them at a stitch near one point. 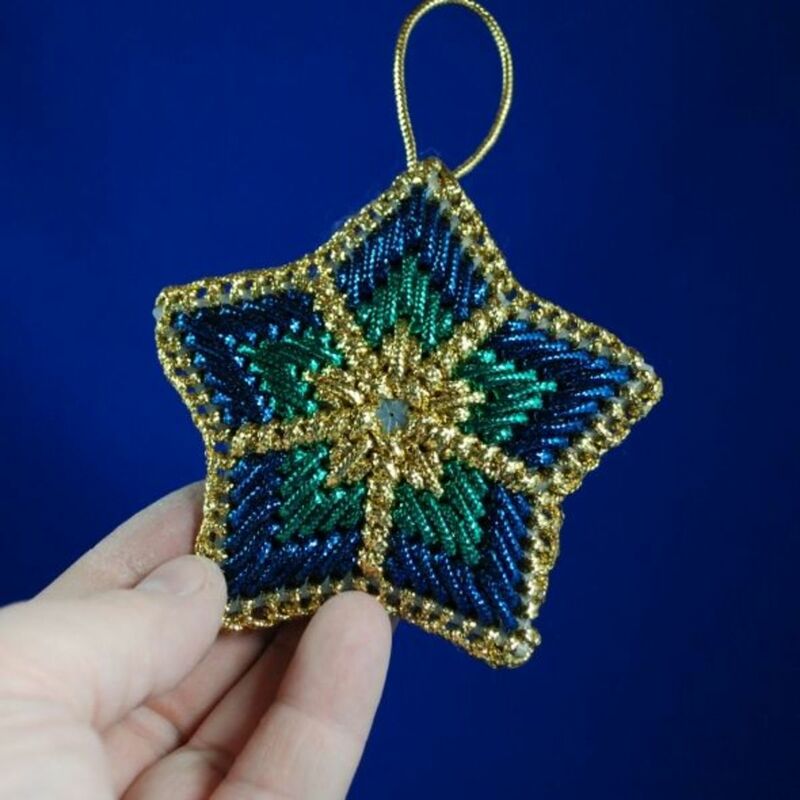 For this ornament, I used a simple whip stitch to join. Work your joining stitch down one point, the most of the way up the next, stopping just short of the point. Now it's time to add the hanging loop. Slide the loop into place at the point, making sure the knot is not too close to the point, as it will interfere with the stitching. 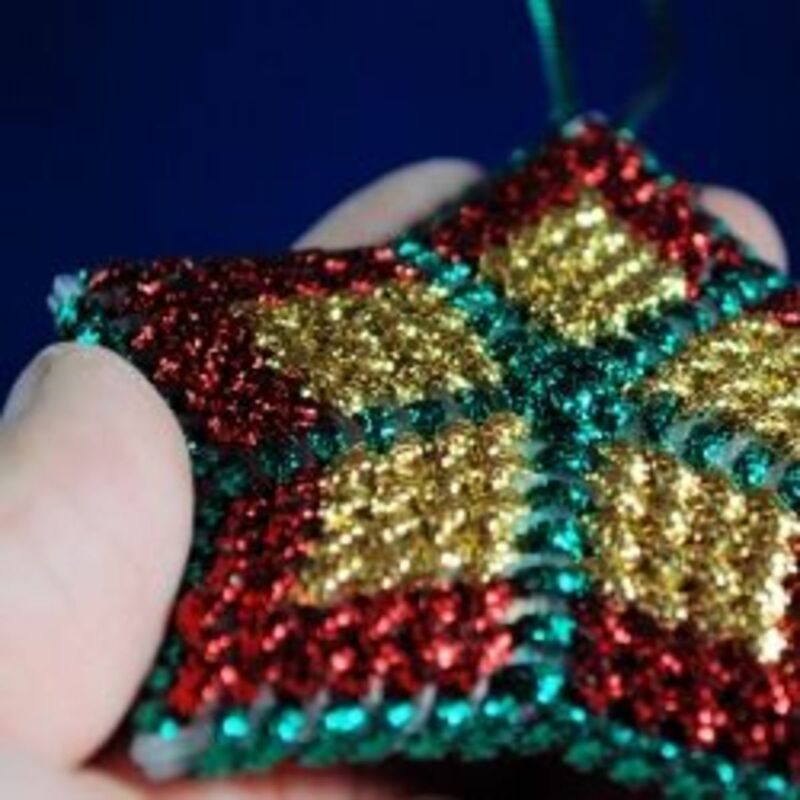 Also make sure the ends are straight and flat inside the ornament, so that there are no unwanted lumps and bumps. Continue whip stitching the edge, making sure to work point stitches through the loop, as picture above. The knot of the loop will be under the point stitches. This ensures that the loop cannot be accidentally pulled lose. Continue whip stitching around all edges. On reaching the last stitch, anchor your cord end by passing your needle between the two layers, then pulling it out the back piece. It may take a bit of wrestling to get it through - pliers may even be handy to pull the needle out again! 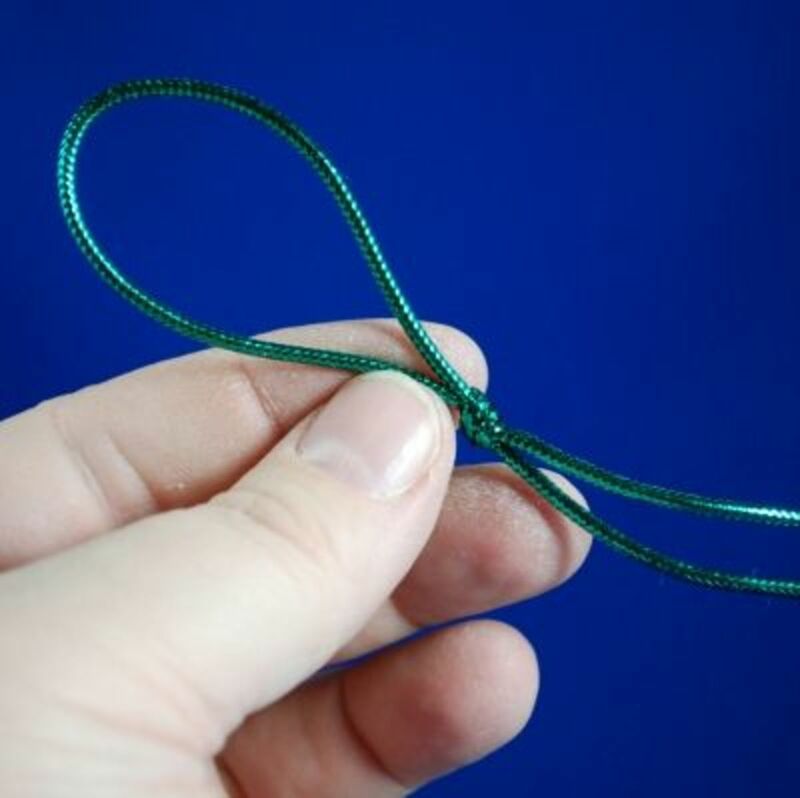 If you have any concern that the tail end isn't anchored strongly enough, pass it through again in another direction, inserting through the same opening the cord exited from. 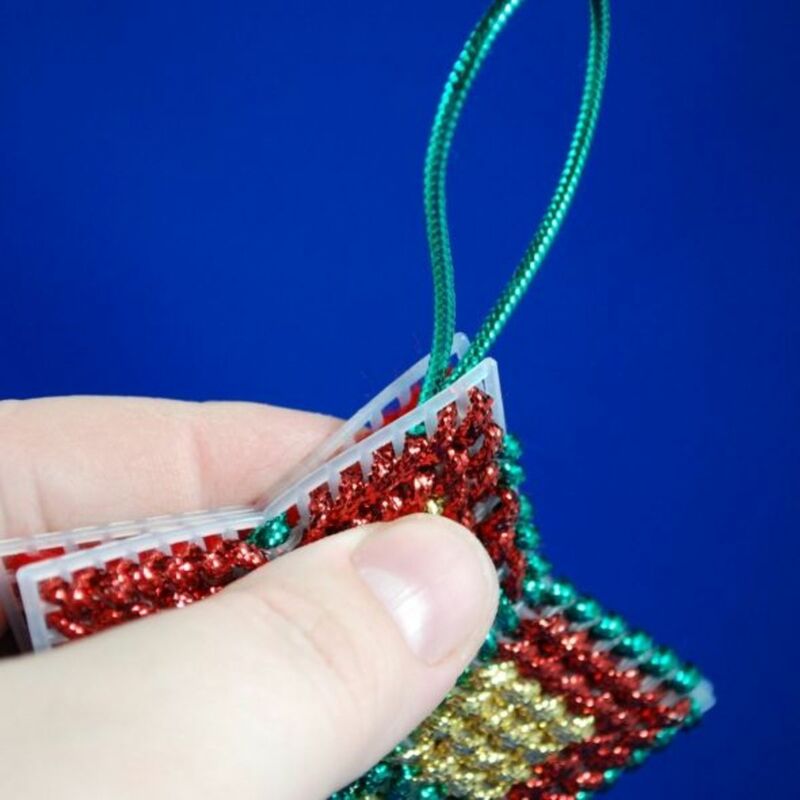 Pull the cord tight and trim close to the ornament. After trimming, bend the ornament back and forth a bit, which will pull any visible bits of the trimmed end into the ornament. Here's a back view of the finished ornament. Here's another version using the star shape. Again, I didn't do a lot of pre-planning for the design, and just used the shape of the plastic canvase. This variant, however, left me with an open space that needed filling. A back view of the stitches. 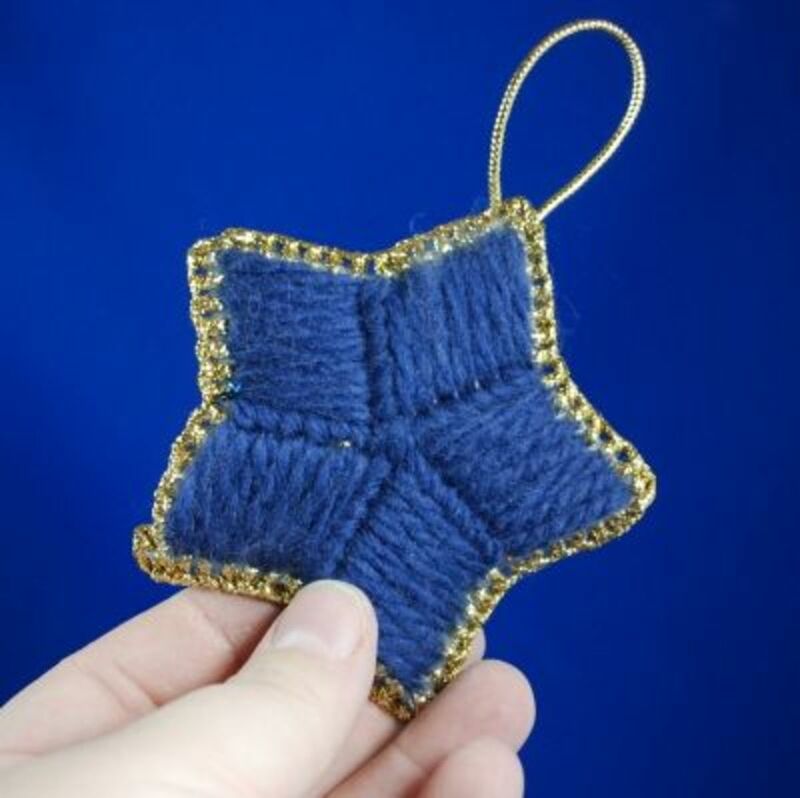 I wasn't really happy with how much of the plastic canvas was visible in the back panel of the first ornament, so when choosing the yarn for the second star shaped ornament, I chose a bulkier yarn and worked straight stitches at an angle. I then went over it again to cover up the "spokes" in between. The inside of the back piece, showing how the ends are anchored in the stitches. 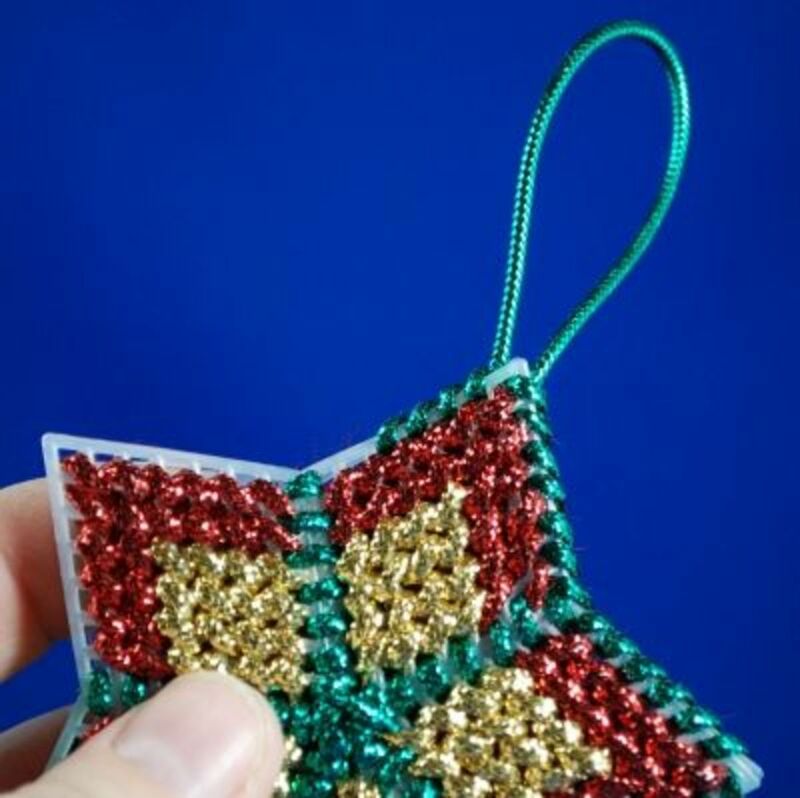 The pieces and hanging loop were assembled the same way as the green, red and gold ornament, except that the edging was done in buttonhole stitch (also called blanket stitch). At this point, it's finished except for the empty space in the middle. To fill the empty space in the middle, I used a gold, adhesive backed gem that I found among some scrapbooking supplies. The adhesive backing can't hold to the cord, so a bit of gold glitter glue was used to keep it in place, then left to dry overnight. Not yet, but I intend to! No, I just don't have the time/money/resources. No, I don't do crafts. For the square pieces of plastic canvas, I decided to do variations of four way bargello, orienting them to hang as diamond shapes. These required more planning on graph paper. 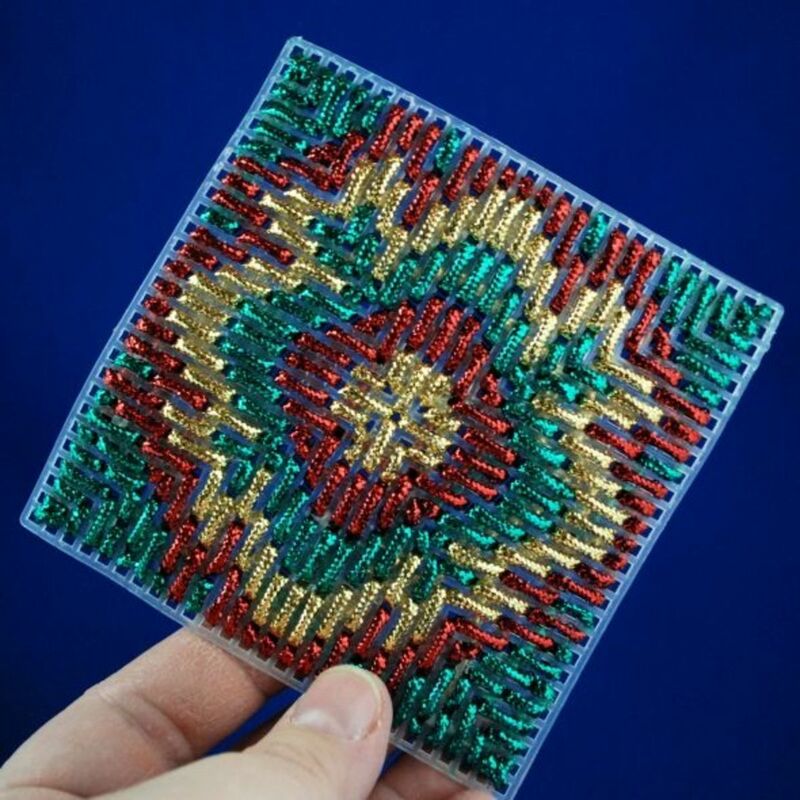 Whatever the design, an important part of working four way bargello is to mark your stitch surface from corner to corner with guidelines. 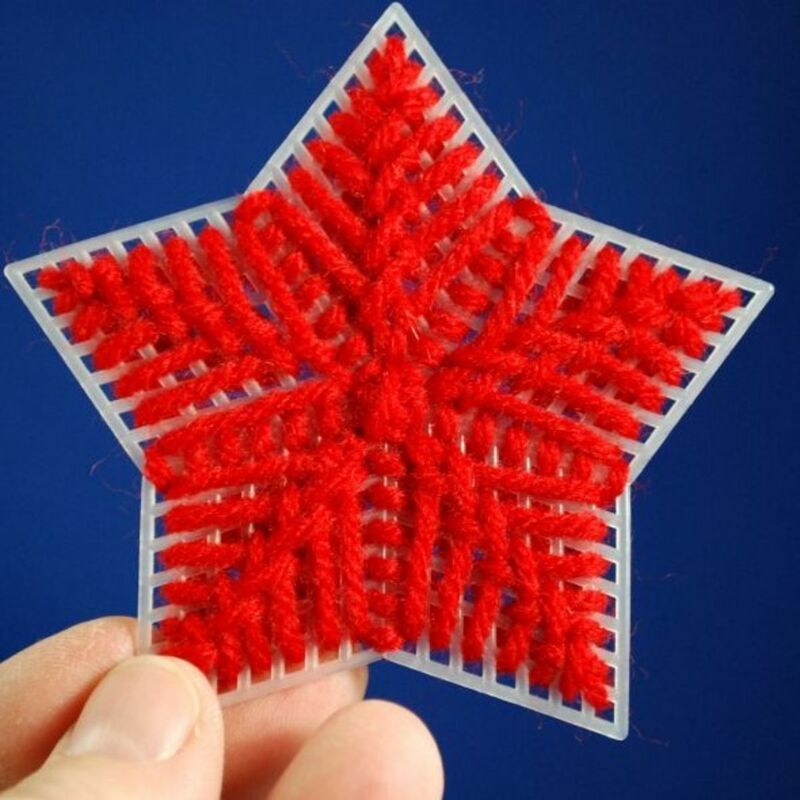 The easiest way to do with is with just a bit of sewing thread. Once your pattern is worked out on graph paper, it's easier to start stitching a row that's in the middle of your pattern. The other colours are then worked in or out from there. Once this first row of stitches is worked, the diagonal guidelines can be removed. Here is the completed front of one pattern I'd worked out. 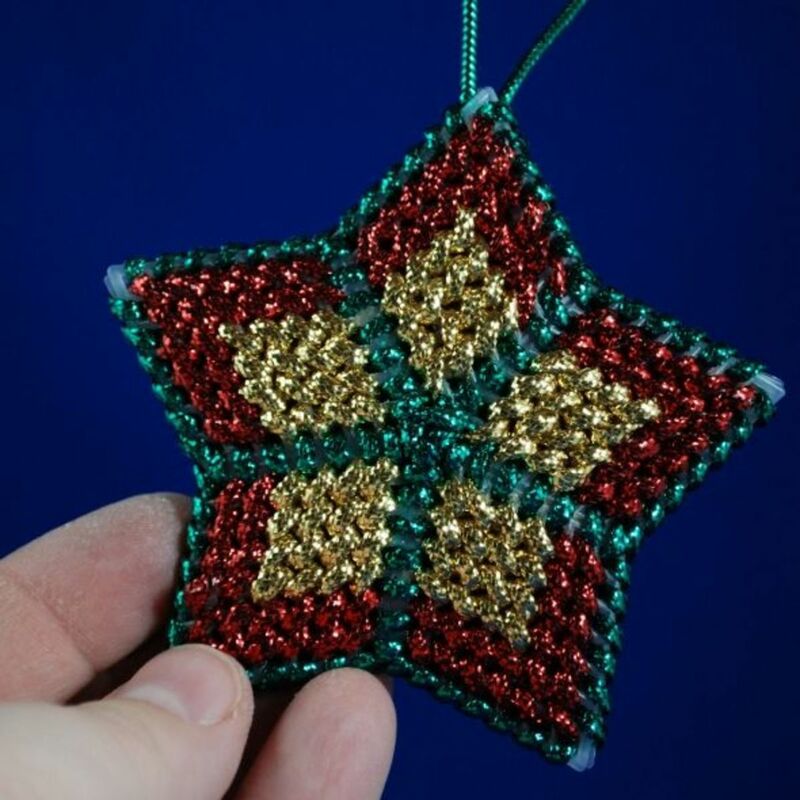 Here's another variation of four way bargello. 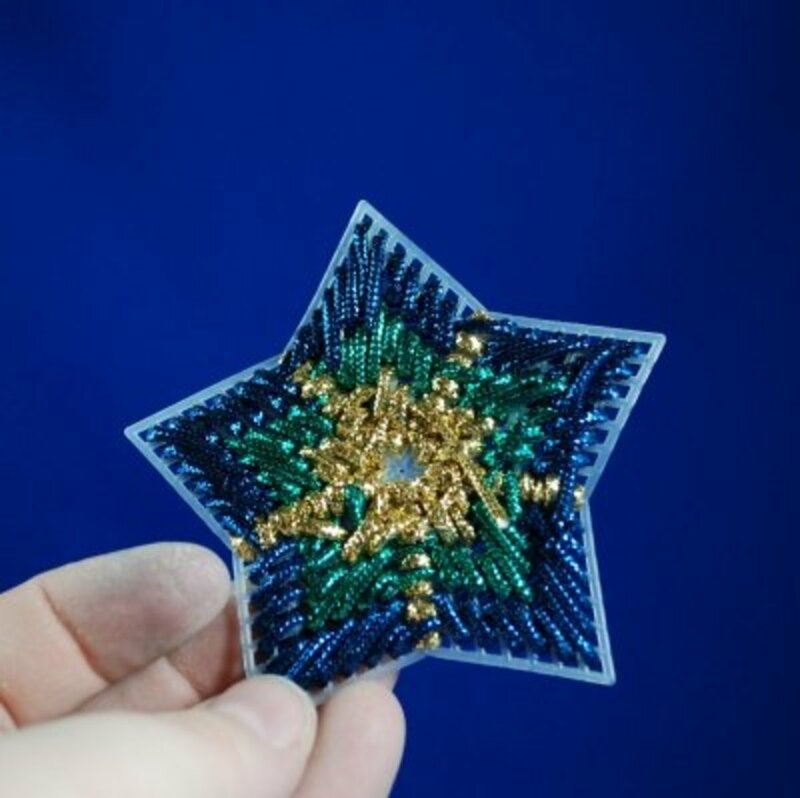 Like one of the star ornaments, this one left an empty space in the middle, which was filled the same way as the blue, green and gold star ornament, with a gem and glitter glue. 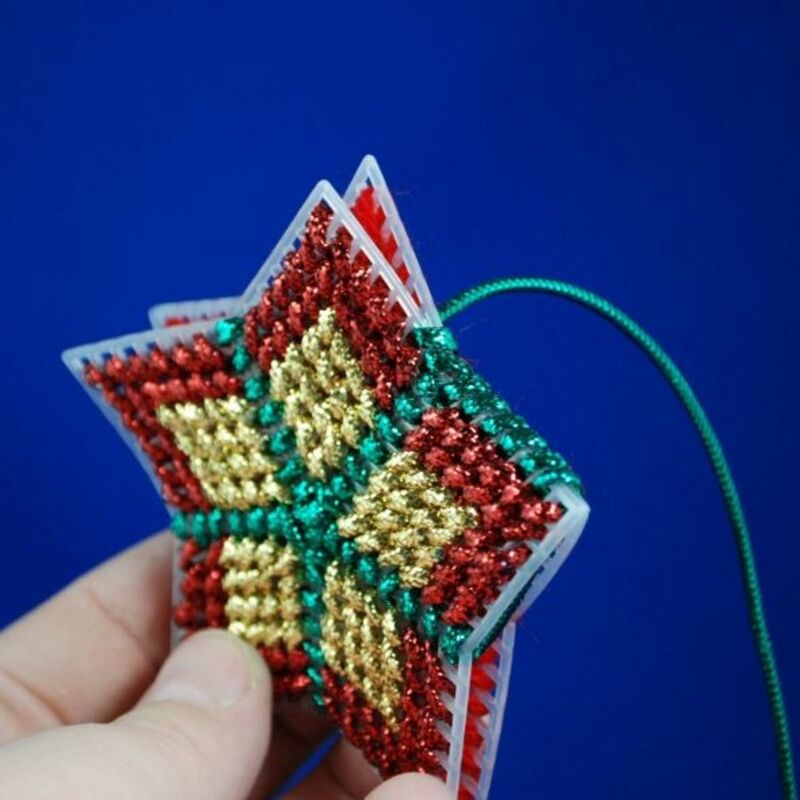 These ornaments had their backs and loops attached the same way as the star shaped ornaments. I used red yarn for them, which worked our rather well, but doesn't photograph well! One of the fun things about using our Christmas tradition of making new ornaments every year is trying out new methods, materials and styles. Some of these become favourites we go on to use for other things throughout the year. Some... not so much. For these ornaments, I really like how they looked when done. The metallic cord reflects light nicely, and the pre-formed shapes make the job easier. About the only real difficulty I had with this pattern was that it took a fair bit of oomph to work the stitches, with such a large needle and such thick cord. I had to take breaks in between working on them to prevent blisters on one of my fingers, and I found colour had come off the cord onto my hands as well. The cord is actually quite colourfast, but after yanking on it as much as I was, it still left marks. Overall, I give our 2012 ornaments a thumbs up for attractiveness, and they are something I would do again. Just not very often! 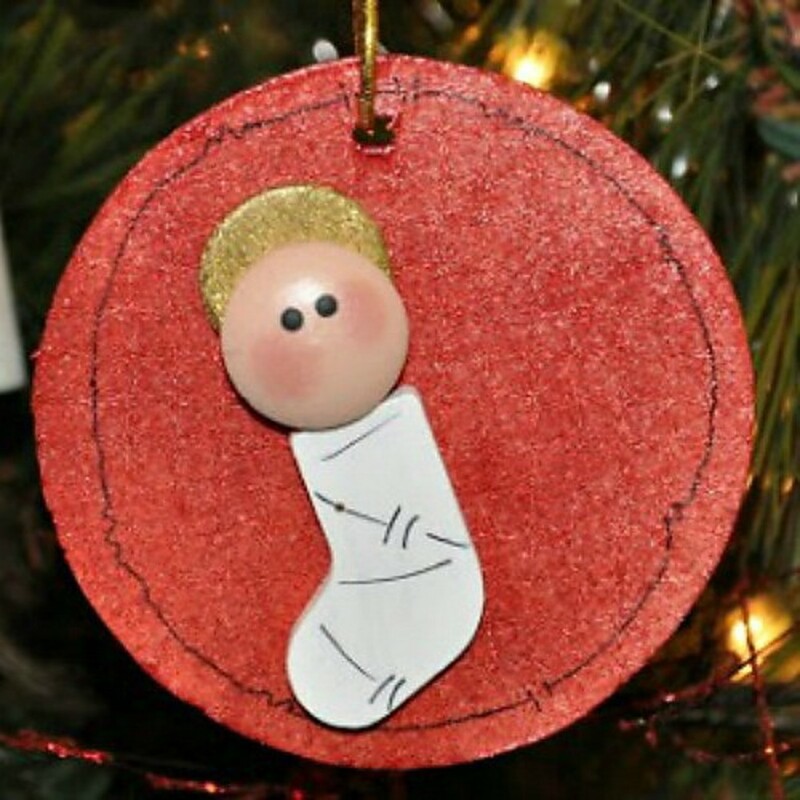 If you're ready to try your hand at making these ornaments, here are some materials you will need. 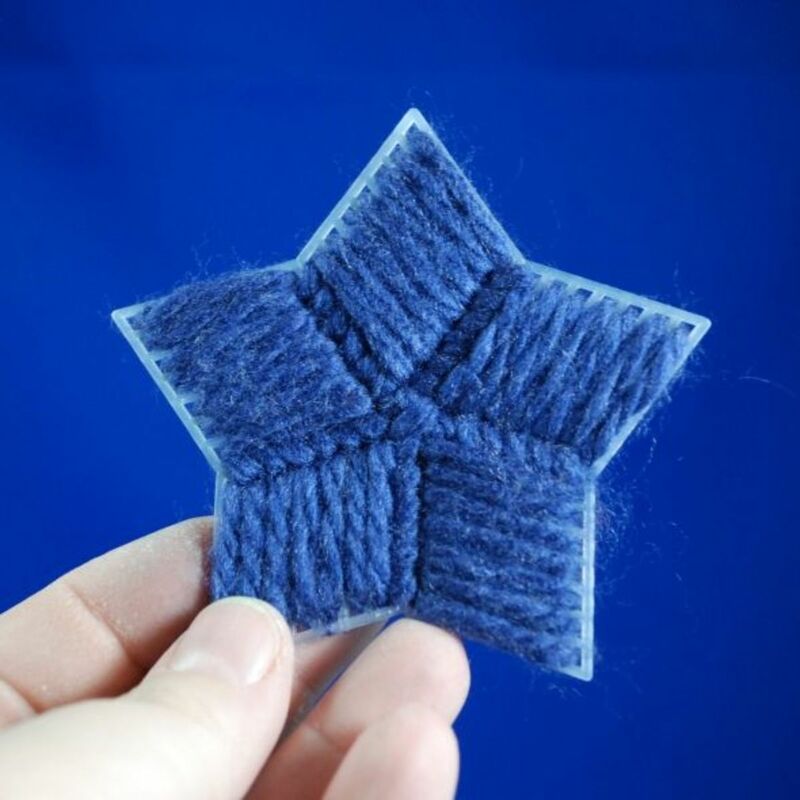 These star shapes make it easy to come up with designs on the fly. Remember that you'll need two for each ornament. This metallic cord comes in a variety of colours and the reflective quality looks great! These gems come in handy for all kinds of projects! I'm always surprising myself at just how often I find myself using glitter glue! What do you think? - Is this a project you'd like to try? Thank you for your posting - after readning your comments may I make a couple of suggestions. 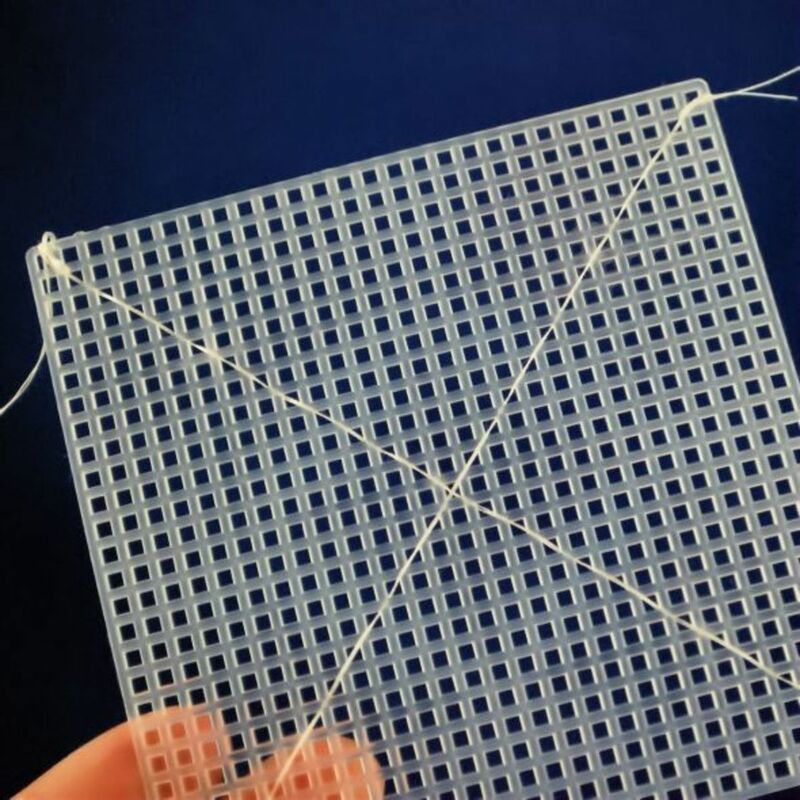 I love Darcie cord and use it quite a bit, but I have found it to be hard to work with until I accidently ran across a solution. As I cut a piece of Darcie cord I take the cord out of the center of it. It makes the piece more plyable and much easier to use. Also, I keep a pair of jewelry making needle nose pliers handy for those stitches that are often so hard to pull through. 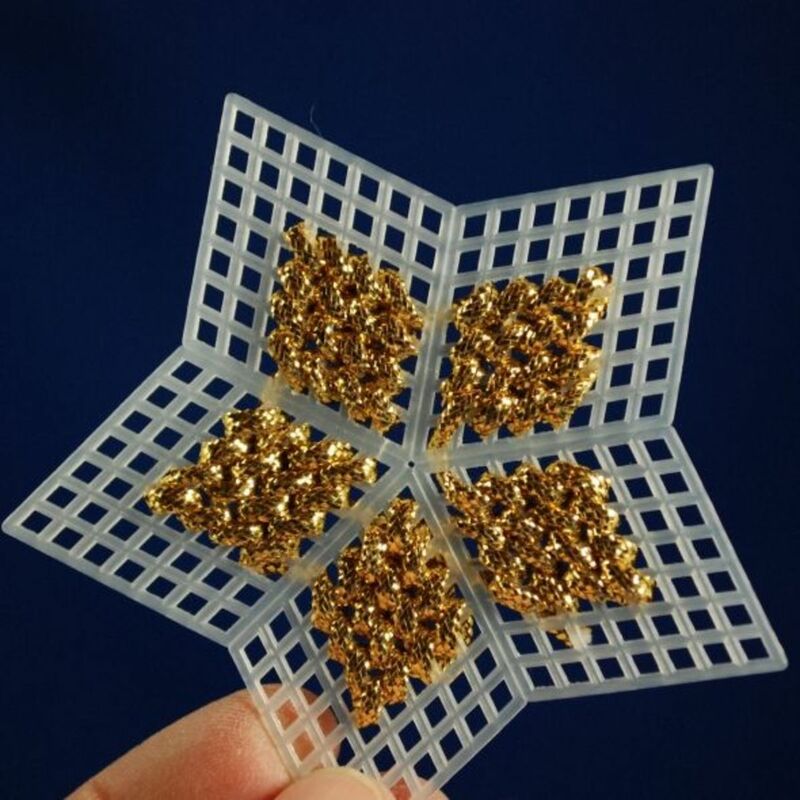 They make a HUGE difference when making several ornaments at a time. I have seen these before but none have been as beautiful as these. 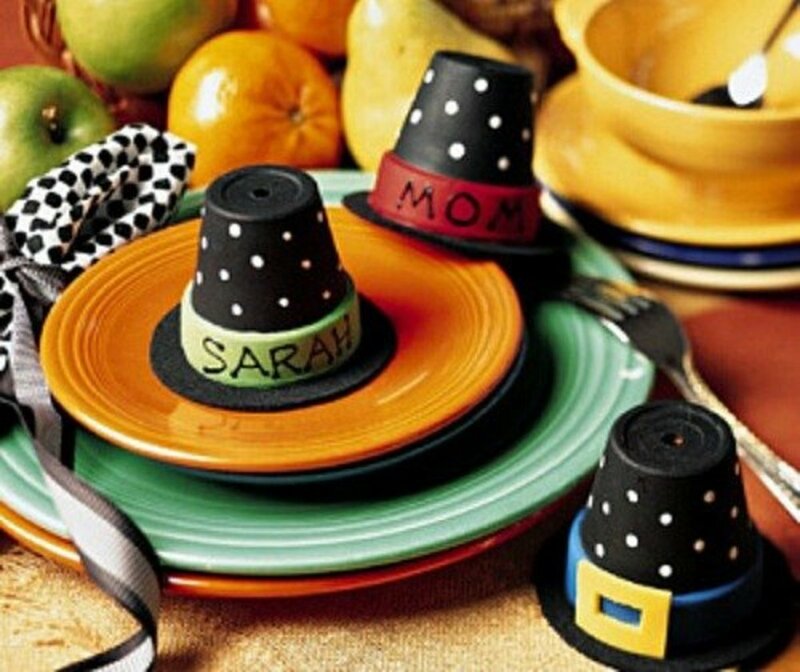 This is a craft that many will enjoy making. Great hub! 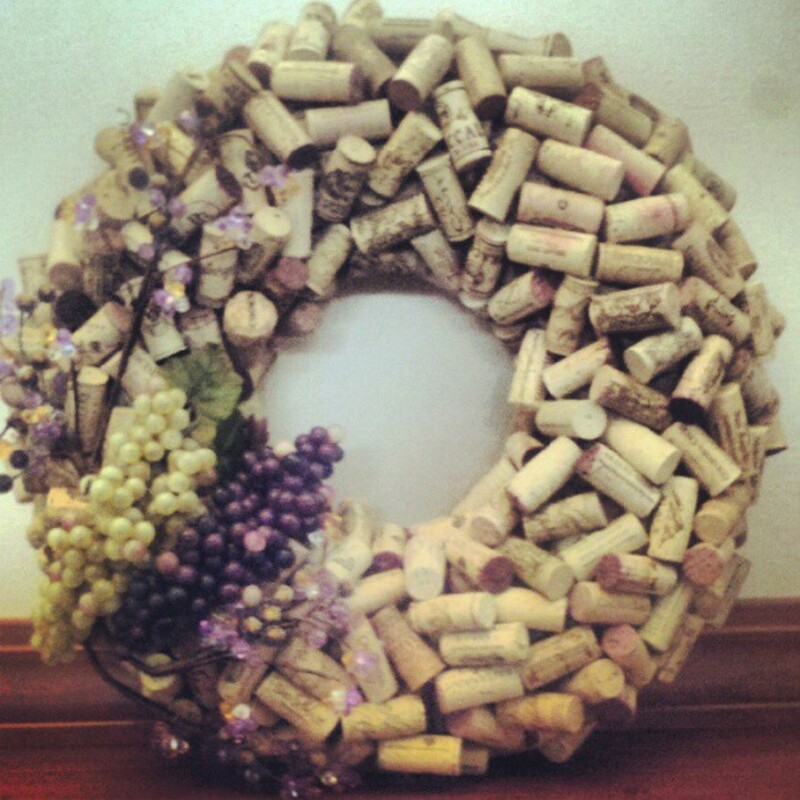 I don't do crafts, but would be delighted to get a gift like this from someone who did. 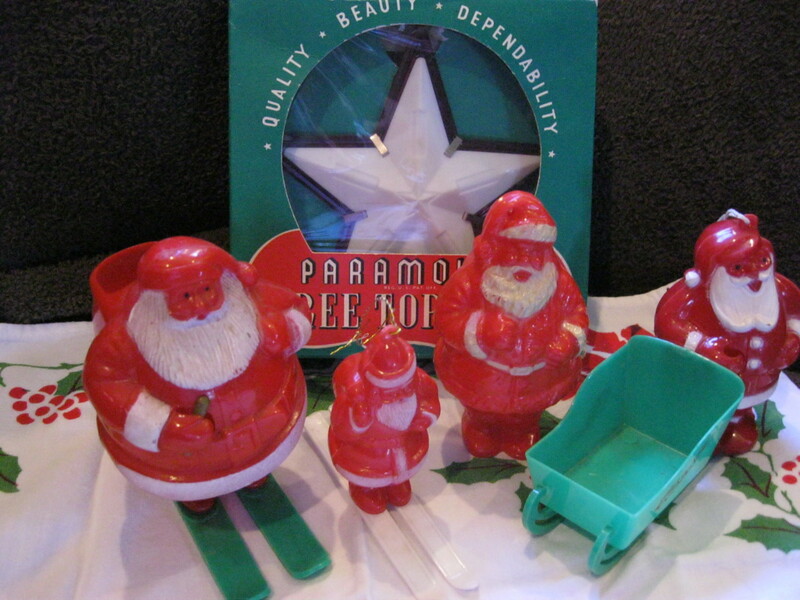 These ornaments look beautiful and sturdy and would make great family heirlooms. Voted up across the board except for funny. Really pretty Anna! 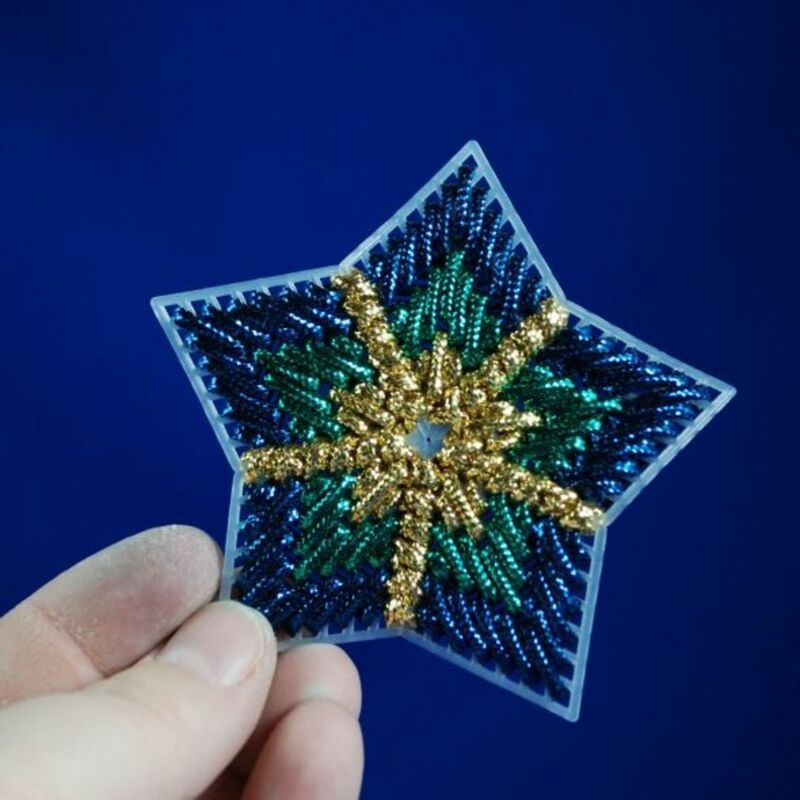 I like how you marked your Bargello canvas with thread what a great idea. I usually make a mark with a sharpie pen. I love that Darice metallic cord. I had a hard time with it, but it sure looks pretty. I only used it a few times. I have made hundreds of plastic canvas items since 2010. Great Hub story Anna! Great lens! I love plastic canvas crafts and make them all the time. 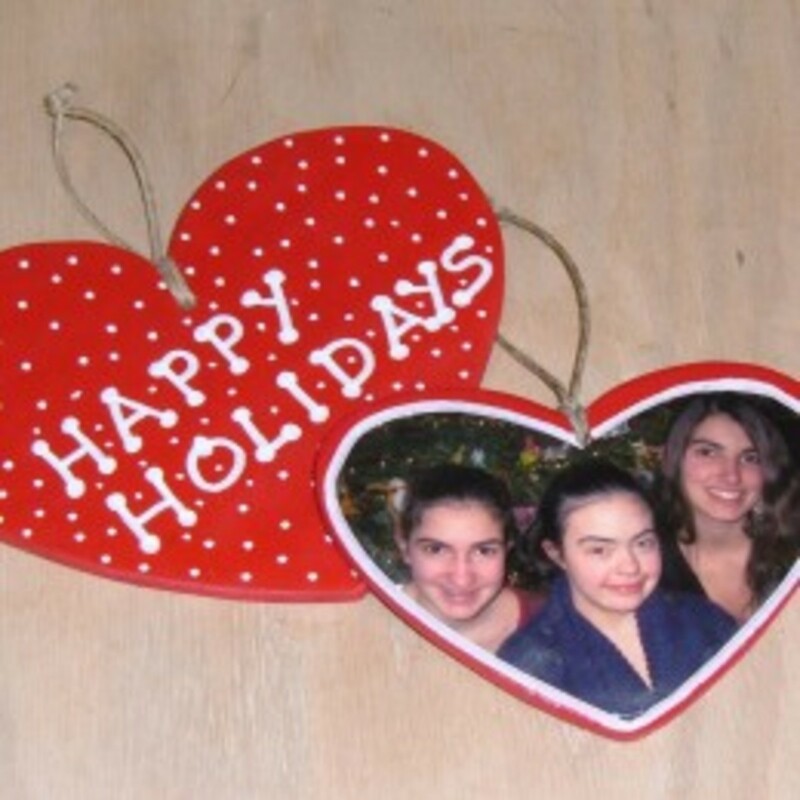 I have made ornaments, Barbie furniture, lots of frog items (my mom collects frogs) and even 8 x 10 pictures. I also love to design my own patterns. Glad to see someone else who does plastic canvas. 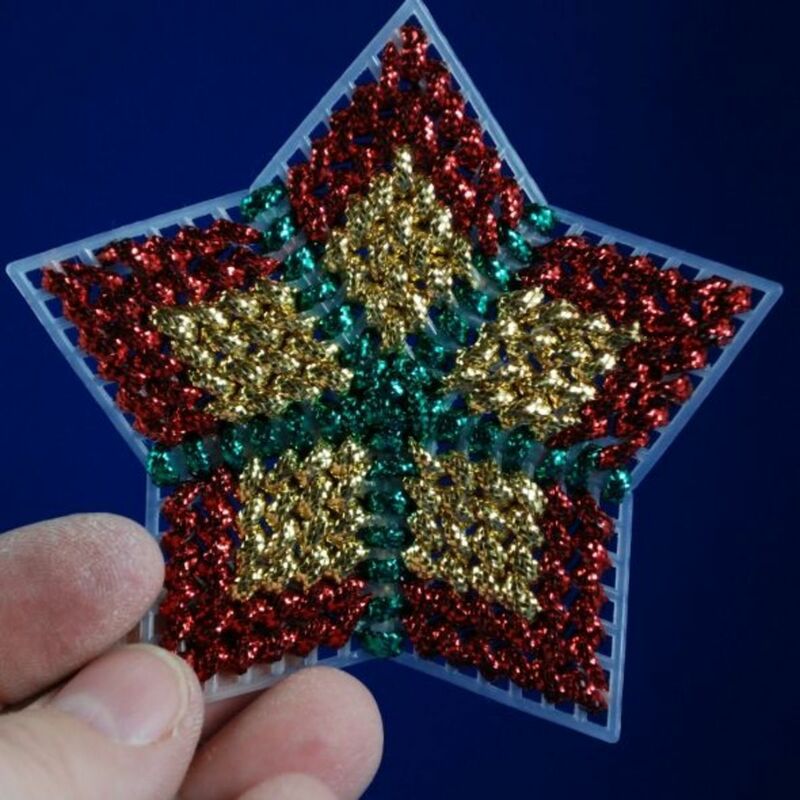 These Plastic Canvas Ornaments are great and make such a great craft project, I like all the different colors and patterns that can be used too. Creative ideas! I will show your lens to my wife! Congrats for your TOD! 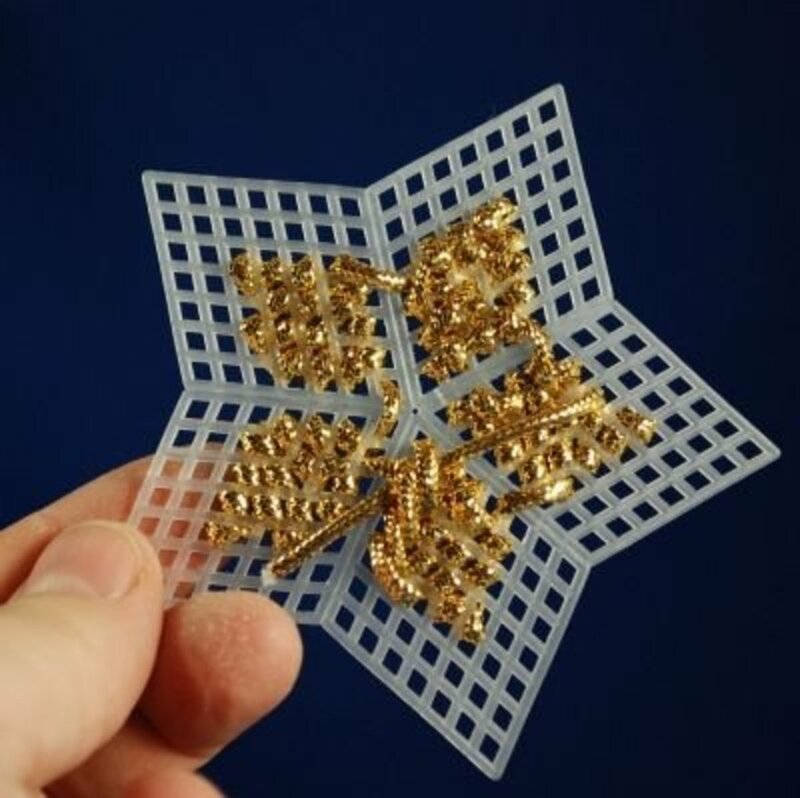 Wow, it's been awhile since I've thought about the plastic canvas crafts. This is a really detailed how-to page. Great job.